The German energy transition makes it necessary to extend the transmission grid. Karlsruhe Institute of Technology (KIT), together with the grid operator TenneT, now studies the use of superconductor technology as an alternative to conventional power cables for short grid sections within the framework of the ENSURE Kopernikus Project. The superconductor cables designed by KIT for this purpose are efficient and powerful. After successful testing, they might allow for a more compact construction of power transmission lines in the three-phase grid. The length of the transmission grid in Germany totals about 35,000 km. To ensure that the power produced from renewable energy sources gets to the locations where it is needed, it is planned to extend the grid by about 5,300 km in the course of the energiewende. Within the framework of pilot projects, underground cables are planned to be used near cities and villages in particular. Major advantages could be achieved if they would be replaced part-ly by superconducting cable systems,. This is the result of a feasibility study carried out by KIT in cooperation with the grid operator TenneT under the Kopernikus project ENSURE. The study is planned to be completed by the end of this year and will also cover ecological and economic aspects. The feasibility study is based on cable and cooling concepts specially designed for the voltage of 380 kilovolts (kV) of the German transmission grid. "This is a big technical challenge, because super-conductor technology has never been used before on this voltage level," says Professor Mathias Noe of KIT's Institute for Technical Physics, who coordinates the development project. "We have now demonstrated that this is technically feasible with our new cable concepts." The cable system is designed for a continuous power of 2,300 megawatts (MW). Losses under a high current load are significantly smaller than those of a comparable above-ground line or conventional cables with a copper conductor. Superconductor technology might also be advantageous in transmission line construction, explains Hanno Stagge, who manages the project at TenneT: "A conventional cable system in the transmission grid requires twelve three-phase power cables. A superconducting cable system can transmit the same power with six cables." As a result, grid operators could significantly reduce the width of a line. Another ad-vantage consists in the fact that the setup of the cable compensates current flow in the electrical shielding layer. Consequently, no magnetic field exists outside of the cable and the cable is operated without any emissions. But it is still a long way to maturity. 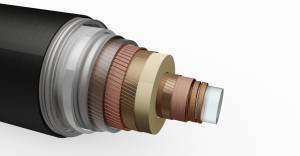 "After the study, the cable, including the necessary coupling sleeves and terminations, will have to be produced first. Then, it will have to be tested extensively together with a cooling system," Hanno Stagge says. In addition, the lead time necessary to cool the cable has to be addressed. Superconductors are materials, whose electrical resistance drops to zero when the temperature decreases below a certain point, the so-called transition temperature. As a result, these materials conduct current with hardly any losses. The new superconductor cable concepts for the transmission grid are based on so-called high-temperature ceramic superconductors. While conventional low-temperature superconductors have transition temperatures below 23 kelvin, i.e. minus 250°C, high-temperature superconductors have comparably high transition temperatures. With liquid nitrogen, they are cooled down to an operation temperature of about 77 kelvin, i.e. minus 196°C, and can be operated at comparably low costs, be-cause less energy is needed for cooling. Experience gained by KIT in the "AmpaCity" cable project shows that use of superconductor technology in energy infrastructure really works. With more than one kilometer length, the AmpaCity cable is the longest high-temperature superconductor cable in the world. Since 2014, it has guaranteed efficient and stable power supply of about 10,000 households in the city of Essen with a voltage of 11 kV.